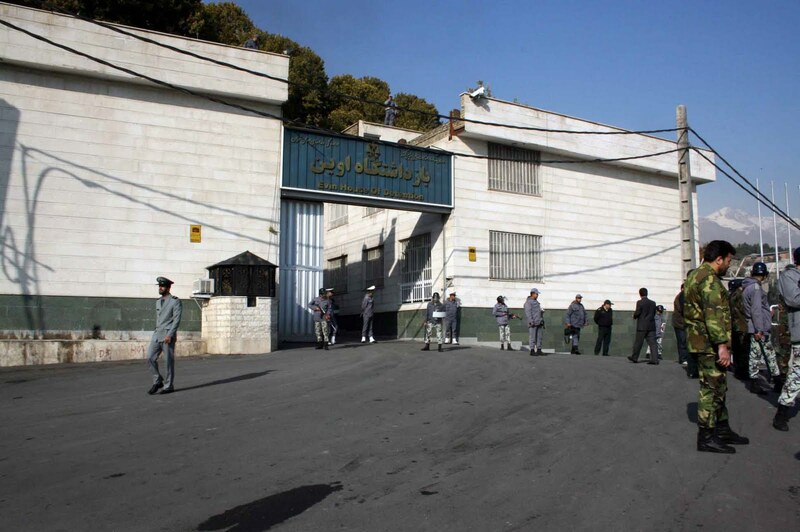 Tehran's Evin prison is notorious for housing prisoners detained unlawfully, interrogated, sometimes under torture. Image from Flickr: Sabzphoto, CC BY-SA 2.0. A version of this post was written by Mahsa Alimardani for ARTICLE19  and republished here under a content partnership. Imagine you’re about to board a flight home with your infant daughter when you are both seized and taken into custody by a group of Iran’s notorious revolutionary guards. They detain you without charge and place you in solitary confinement. Overcome with fear, you want more than anything to be released and reunited with your family. You are willing to do anything that you think could help you in the short-term. Under pressure from authorities, you hand over the passwords to your email accounts. Soon thereafter, your work contracts, financial documents and even family photos are used in a smear campaign against you. This is the situation of Nazanin Zaghari-Ratcliffe , a British-Iranian dual citizen and charity worker who was a project manager for the Thomson Reuters Foundation while living in London at the time of her arrest. She had traveled to Iran to visit family when she and her young daughter were detained in April 2016. Her daughter remains in the custody of her maternal grandparents, also in Iran, while her mother remains detained. While issues of persecution and unjust prosecution are not new in Iran, there are new signs of violations of due process in how people are detained and prosecuted, and in how devices are seized and the right to privacy is violated. Public concern on these issues has also mounted around the case of Canadian-Iranian environmentalist and academic Kavous Seyed-Emami , another dual citizen who was detained in January 2018, and who died in custody at Evin Prison on 9 February 2018. As in the case of Zaghari-Ratcliffe, Iran’s national broadcasters publicised personal information, emails, and photos confiscated by authorities from Seyed-Emami, to accuse him of being a foreign agent. Public smear campaigns based on confiscated digital and physical documents such as those made against Zaghari-Ratcliffe and Seyed-Emami are rare. But confiscations of personal documents are not; and while they are not normally used for media purposes, they are often used by authorities to further prosecute detainees or prosecute other individuals. ARTICLE 19 previously documented this trend in its 2015 “Computer Crimes” report , whereby authorities used intimidation methods to extract information from detainees. These cases bear witness to a judicial system that allows flagrant violations of its own laws, undertakes illegal interrogations that border on torture, and violates fundamental rights to privacy. ARTICLE 19 has called on Iran  to cease these measures, release prisoners such as Zaghari-Ratcliffe, and conduct a full investigation into the death of Seyed-Emami, and return the passport and ability for his wife, Maryam Mombeini, to leave Iran . On 7 December 2017 Press TV, an English language branch of the Iranian state broadcaster IRIB, released a documentary on Nazanin Zaghari-Ratcliffe’s alleged work encouraging “sedition” in Iran. 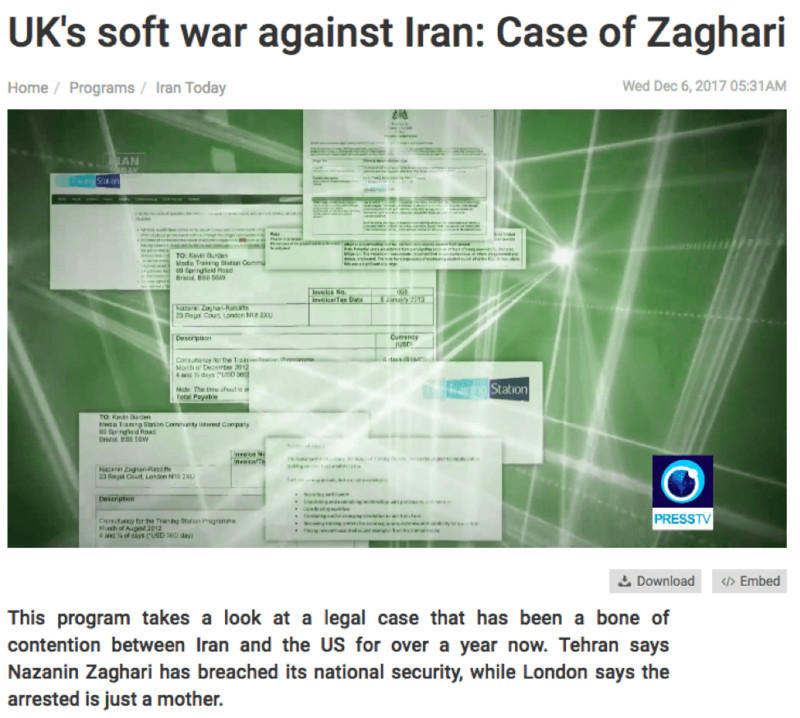 Aired on the eve of a new court case suddenly created to prosecute Zaghari-Ratcliffe a second time, this documentary in English and Persian appears to confirm that Iran’s security officials extracted invoices and contracts from  her emails. In the documentary, authorities misrepresented these as monthly salaries paid by the BBC in an effort to smear her. It had not been a secret by either Zaghari-Ratcliffe or the BBC that she used to work  for the BBC World Service Trust (now BBC Media Action) in the capacity of a “training assistant” as a “junior and purely administrative” role on programs designed to train Iranian journalists from February 2009 to October 2010. Photos showing Zaghari-Ratcliffe without a headscarf were spread to denounce her as an agent of the west in Iranian media before her court appearance. This false propaganda was created to block initiatives for her release and justify the violations she endured through her detention. Image: Press TV images of documents that PressTV claim sto have acquired through security agencies. According to the Seyed-Emami family and lawyers representing them, there has been no medical report  to verify his cause of death. Authorities have denied the family an independent autopsy. Meanwhile, the Islamic Republic of Iran Broadcasting Corporation (IRIB) aired a documentary based on evidence that appears to have been extracted from Seyed-Emami’s devices, online accounts, and physical raids of his family’s home, including private family photos and benign communications with friends and contacts. One email between Seyed-Emami and a US friend was used in the documentary to conclude that Seyed-Emami had ties with US intelligence arms, with no supporting evidence. Photo: IRIB’s 20:30 show airs a documentary smearing Seyed-Emami put forth a seemingly benign correspondence between him and a contact named “David” as evidence of Seyed-Emami’s role as a foreign spy. These two cases underline deeply worrying trends for the protection of human rights and fundamental freedoms in Iran, in particular the presumption of innocence, the right to due process and a fair trial, and the right to privacy, as recognised under international human rights obligations. The readiness of Iran’s judiciary and the IRIB to accept false narratives of “espionage” and evidence extracted from private communications and devices of detainees undermines the legality under which evidence is obtained and used. Moreover, stipulations in both Iran’s Criminal Code and Computer Crimes Law on the rights of the prosecutor to access defendants’ personal data violate international standards on privacy. Iran’s Criminal Code provides powers for electronic accounts and data to be seized in Article 104 , with a similar provision within Article 48  of the Computer Crimes Law. Although Article 103 of the Criminal Code states that only documents relating to the crime may be secured, this was clearly not the case for Zaghari-Ratcliffe. The prosecution accessed all of her private and personal data in pursuit of its vague, broad charges. The illegal detainment and ill-treatment of Zaghari-Ratcliffe and Seyed-Emami, and forcible extraction of their information via illegal interrogations further violate international law. According to her family, Zaghari-Ratcliffe was detained without charge at the airport, taken to Kerman province, placed into solitary confinement and refused legal counsel when her accounts were seized and searched. Iran’s legal procedures for accessing the devices and accounts of these two prisoners remain unclear. But evidence used in media narratives and adjudications against Zaghari-Ratcliffe and Seyed-Emami prove that the actions of Iran’s intelligence agencies, namely the revolutionary guards, have dictated these cases, as opposed to any criminal procedures, laws and regulations. It is more important than ever that Iranian authorities acknowledge protections provided under national laws and the international obligations they are party to, and stop its blanket use of “national security” concerns to target individuals and assert power.